This listing is for a TROPICAL ISLAND villa, at Cocoplum Beach and Tennis Club and Marina, which is one of the 2 villas close to the office and the tennis court with a garden view! (only a 3-4-minute walk to the beach and pool area) Perfect for Family Reunions or Two Couples Traveling together - Deep water docks on protected canal (water & electric). Heated swimming pool overlooking swimming beach. Jacuzzi & tennis court onsite. Located at mile marker 54.5 in the middle of the Florida Keys. Year around great weather for fishing, diving or just enjoying the great tropical weather. Most book for 7 nights and arrival and departure any day of the week. (Ask about shorter stays (2 to 6 nights) or arrival any day of the week when space available.) Relax in the shaded breeze in a beachfront tiki overlooking our oceanside pool. This 2-bedroom, 2-bath Vacation home is fully furnished: complete kitchen and dining room; a queen size master bed; a queen bed and a twin size bed in the guestroom; a family room with queen-size sofa-bed; (sleeps a maximum of 6 people), 3 flat screen cable TV’s; a wrap-around screened porch; and your own laundry room. The ground floor is the utility room with a washer and dryer and storage area. A set of exterior stairs brings you up to enter the main entrance door to the villa on the first floor (dining room, kitchen and screened in balcony), there is an interior spiral staircase the brings you to the second floor (living room, 2 bedrooms, 2 bathrooms and wet bar). We do not have any elevators on the property. Marathon is the Heart of the Florida Keys! Go deep-sea or back country fishing, sailing, diving and snorkeling, and then finish your day at one of the many restaurants nearby. Key West, with its colorful history, shopping galore, is 54 miles south. We do require a “Property Fee” of $20 (plus tax) per night per villa for the cleaning of your villa after you depart. (We do NOT provide daily housekeeping). This fee also includes FREE Wi-Fi; self-parking; Tennis Court; local & toll phone calls. This charge is automatically charged to each villa for each night of your stay. 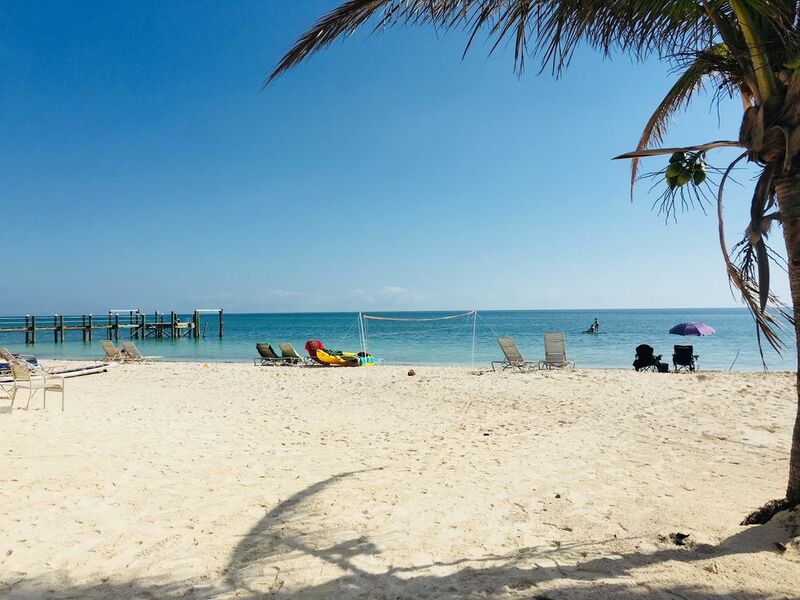 There is NO additional FEE for BEACHFRONT AMENITIES that include Pool, Beach, Tiki Huts, lounge chairs located poolside along the beachfront, Jacuzzi, and parking for boat trailers. At least one person in the group must be 25 years old or older. Maximum occupancy is 6 people per villa including all children. No day visitors are allowed. We are a small property and only registered guest may enjoy the amenities. The resort property is located directly on the beach on the Atlantic Ocean. The front 4 units are considered “Beach Front” units (most expensive). The next 6 units are “Palm Court” villas (a little less expensive). The next 8 units are “Key Lime Grove” villas (best value) and the last 2 units “Tropical Island" villas (least expensive) are overlooking the tennis court and are a short walk to the beach and pool area. Get 2 or more vacation homes on the same property when traveling with extended family and friends or a corporate retreat. See our other listings for different rates and availability for the different unit locations. (Beach Front Villas, #4244559, #4270928, #4464408) and (“Palm Court” Villas #4244558, #4270929, #4352045, #4464407). (“Key Lime Grove” Villas #4244560, #4259228, #4317165, #4352046, #4464406, #4987626), (“Tropical Island” Villas #306629, #4317164, #4464405), And our 4-bedroom 5-bathroom home overlooking Bone fish Bay sleeps 10, pool sunset views and a huge boat dock and plenty of parking #109763. Boat dockage (limited availability at additional cost depending on the season) (clean water and protected area from the weather), deep water access for the docks, family reunions, weddings, corporate retreat. Boat dockage (limited availability at additional cost depending on the season) (clean water and protected area from the weather), deep water access for the docks, family reunions, weddings, corporate retreat. Amenities: Beach, Jacuzzi, heated pool, full kitchen, Linens and Towels, Tennis Court, Free washer and Dryer, tiki huts, hammocks, sleeper sofa. Activities: Great Diving or Fishing all water sports nearby. Or just hang in a hammock overlooking the heated pool. Swim with the dolphins at the Dolphin Research Center only 4 miles away. Visit Key West for the day just 1 hour’s beautiful drive over the 7-mile bridge away. Dive on one of our many wrecks. Great fishing and diving year around. Some of the best Tarpon fishing in the world in May and June every year. Area: We are 2 hours from Miami Airport. 2.5 hours from Fort Lauderdale airport. Key West is only a 50-mile beautiful drive away. The drive is over 25 bridges which connect all the islands of the Florida Keys. We centrally located right in the middle - The Heart of the Florida Keys island chain! Location Location Location. In the absolute middle of the string of islands known as the Florida Keys. Only 50 miles to the southernmost point in the USA keys west and 50 miles north to the mainland. We are on one of the very rare beaches in the Florida Keys. Marathon is a quiet island for rest and relaxation. Some of the best diving and fishing in the world. Warm tropical breezes all year long. Our pool is open 365 days a year. Pool is heated from late December until March 31 every year, even though it is not many times in February and March. Very rare in the Florida Keys to have a natural sandy beach. Then in additional equally is rare to have a pool overlooking the Atlantic Ocean. Each villa is self-contained with no adjoining walls to the next villa. A home away from home. There is no Cleaning fee but we do charge a “Resort Fee” of $20 plus 12.5% tax per night per villa. This fee includes FREE Wi-Fi; self-parking; Tennis Court; local & toll phone calls and also for the cleaning of your villa after you depart. (We do not provide daily housekeeping). This charge is automatically charged to each villa for each night of your stay. At the center of Marathon, there is Publix, Winn-Dixie, K-Mart, Walgreens, Office Depot, Home Depot and numerous gift shops and stores where you will find a selection of products for souvenirs. This is Tropical Island villa #16 and #18, located 2 minutes walking distance to the beach. This villa located towards back of property. Each unit has a flat screen TV in the living room, a sleeper sofa and a wet bar and a card table. Full size refrigerator and freezer. Bait freezer is available for a small extra cost. Cook top and Oven. Plenty of pots and pans to create your family meals. All the dishes and utensils to serve a family of 6 for 3 meals a day if needed. Blender for mixing those tropical frozen drinks like Pina Colada's or margaritas. Nice table just outside kitchen for indoor dining for 6. Also, there is a table on the patio if you want to enjoy dinning with our warm tropical breezes all year long. We have a small library in the office. Take a book or leave a book for the next guest. There is no fee to you the library. We have plenty of games for you to use in the office. There is no charge to use any of our board games. Free tennis racket and basketballs to use while you are on the property. No elevator’s onsite. We have an exterior set of stairs to enter the unit. And we have a spiral staircase in the interior of the unit to access the bedrooms, bathrooms and living room on the second floor. Open 365 days a year. We have a large pool overlooking our natural sandy beach and the Atlantic Ocean. The pool is heated from Dec 20 to March 31 The rest of the year the heater is not needed. Open 365 days a year and located in our court yard surrounded by Palm Trees and tropical landscaping. Monthly rates in January to early February. Or September to December 15. Call for special rates for stays more than 14 nights. We are in the middle of the Florida Keys which is a chain of 43 islands connected by bridges (one that is 7 miles long) than covers 120 total miles. We are located at mile marker 54.5, which is pretty much right in the middle of the Florida Keys. Today the total land area of the Florida Keys is 137.3 square miles (356 sq. km) and in total there are over 1700 islands in the archipelago. However, very few of these are populated and most are very small. Only 43 of the islands are connected via bridges. In total, there are 42 bridges connecting the islands but the Seven Mile Bridge is still the longest. Because there are so many islands within the Florida Keys they are often divided into several different groups. These groups are the Upper Keys, the Middle Keys, the Lower Keys and the Outlying Islands. Very secluded, good amenities, and a great location. The staff is very friendly and helpful. Any concerns you may have are addressed immediately. Very quiet location. I saw a review that mentioned all of the stairs. If you live in a two-story home, it won’t be an issue. However, if you have health issues and cannot use stairs, consider another location. There is a staircase from the ground to the first level and a spiral staircase to the bath and bedrooms on the second level. The kitchen was small, but well equipped. Overall, it is very clean, quiet, and perfect for families. We really enjoyed staying at the Coco Plum. Overall we enjoyed our time at this location. The staff was very professional and friendly and the upkeep of the outside of the units was great. The location was very clean and presentable from outside the unit. The pool, hot tub and pool house area were nice. Each unit had its own washer and dryer and we were provided with cleaning items such as laundry detergent, toilet paper, trash bags, kleenex, etc. The location is convenient to Marathon, which offers many options for activities such as snorkel, scuba diving, the Turtle Hospital, grocery stores, restaurants, etc. Our unit was VERY outdated. The nice pictures on the website were definitely not taken from our unit. That was our biggest disappointment in the money we paid was not for what we thought we were going to get. Major renovations need to occur in the unit we were provided. From talking with other people staying at the location about half of the units have not been updated. The carpet was old and stained. The cabinets in the kitchen were dated. The appliances in the kitchen were old. Floor to ceiling mirrors in a wet bar area upstairs. The light fixtures were from a few decades ago. The pillows need to be updated and the room that has a full and a twin bed was very tight to move around in. The exhaust fans in the bathrooms did not work. Since the location has a beach, we would have expected the unit to provide beach/pool towels. The beach area was kind of taken care of. The beach is not that wide (maybe 300 feet wide and 75 feet from the water to the pool) and you have private property signs on either side so you are limited on space for walking on the beach. The beach clean-up was one pass with the beach comber (maybe 8-10 feet) and that was it. That section was nice, but against the water was a lot of sea grass and on the other side closest to the pool was hard. We all agreed we would stay at this location again as long as we were guaranteed a renovated unit. Our rating of 3 stars was mostly due to the pictures of a very nice unit that we thought we were going to get, only to find out we had a unit that hadn't been updated since the 1980's. The place is amazing!!! Clean and quiet. The apartment is very organized. Staff very polite. Tennis court in really good shape. The swimming pool is really nice. They dumped my friends fishing equipment. All in all we we enjoyed the property. It's not their fault, but the seaweed smell at the beach was awful. We spent zero time on the beach and a limited amount of time in the pool, which was very disappointing. Unit was comfortable but the air conditioning blows very loud and cold. All receptacles were too large to hold plugs from our electronics. Loved the location and uniqueness of the round units. Common areas under the units were kept up nicely. Enjoyed our time in the Keys. made day trips to Key West, Key Largo, Bahia Honda and Sombrero Beach. We had a great time, rooms were clean and picture perfect. The location of the resort worked out for us being that Key west was an hour away. I would recommend Coco plum resort for any couple or family. Marathon is in the middle of the Florida Keys. Just 55 miles north of Key West. 20 miles south of Islamorada. 50 miles south of Key Lago. 90 miles south of Miami Airport. We do require a “Property Fee” of $20 per night per villa for the cleaning of your villa after you depart. (We do NOT provide daily housekeeping). This fee also includes FREE Wi-Fi; self-parking; Tennis Court; local & toll phone calls. This charge is automatically charged to each villa for each night of your stay. There is NO additional FEE for BEACHFRONT AMMENITIES that include Pool, Beach, Tiki Huts, lounge chairs located poolside along the beachfront, Jacuzzi, and parking for boat trailers. At least one person in the group must be 25 years old or older. Maximum occupancy is 6 people per villa including all children. No day visitors are allowed. WE are a small property and only registered guest may enjoy the amenities. Boat Docks are available for an additional fee.